Home Sports and Entertainment Father’s Day Special – Why Dads Are Cooler Than Moms! Father’s Day Special – Why Dads Are Cooler Than Moms! No, this is not a comparison and definitely not a war of sexes. We all love our parents equally (like too much) but then we tend to give extra brownie points to one of them once in a while. C’mon now, don’t be shy – admit it. So many times when mom cooks you good food you are team mom but when dad tips you with some extra pocket-money then you are team dad. On the occasion of Father’s Day, let’s talk about the coolest person you ever met, your very own superhero – your Dad! I think all of us have gone through this phase – we meddled with their fights and ended up taking sides.And later got too much love showered on us through various means (sweets, gifts, picnics, extra money and well “fun parties”). 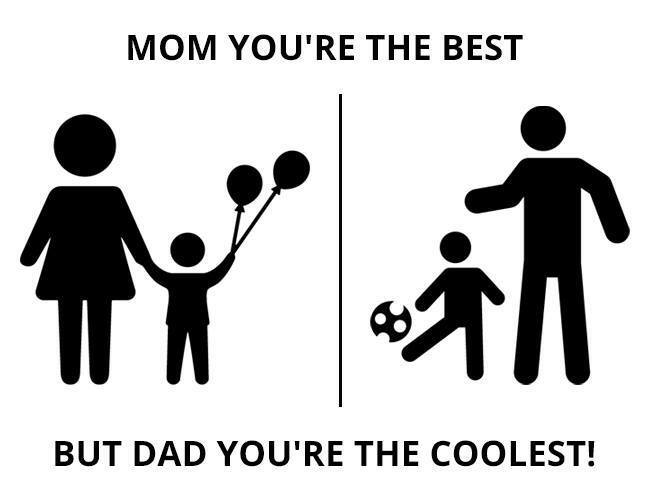 But there are many (very) interesting reasons why dads remain to be cooler and more rad than moms. Well, we all know how moms are when they are having those temper fits. No rhyme and reason can get you out of the situation. And, then comes the SUPERDAD to rescue us from mom’s outburst. Kitchen is mom’s arena and cooking with them is next to impossible. Everything has be perfect and the kitchen needs to be spick and span once you are done. However, dads not only let you have fun while cooking but joins you too. Whoever said you can’t do “drink” parties with your dad must have lost their marbles. Yes, they appear to be strict but one party will change the whole scene. Tried and tested. Moms treat you as well, no denying in that. Still dads have a grand way of pampering you. Gizmos, dresses, bikes and what not. They are the real life Santa Claus. Women spot drama fits easily when compared to men. Hence, all the emotional drama on moms bounces off but works perfectly on our sweet innocent dads. If moms are the best cooks in the whole wide world then dads are amazing sports men. From running to cricket to chess to wrestling to bowling to billiards. They know everything and if they don’t know – they will zealously learn it with you. The safest drivers ever! Trust me when I say this and I’m sure you will! Moreover, riding with them is so awesome – they are the gaali hackers, every nook and corner of your city is known to them like the back of their hand. To be really frank, this list just keeps going on and on and on. Because they are your go-to person for everything – latest news, practical advice, business ideas, job issues, financial guidance, late night house access, breaking house rules, chilling with friends and I can go on. The bottom line remains to be dads are cool in the superlative sense. Moms, we still love you.